Rein in print costs and reduce your footprint with the easy-to-use print management solution that works to save you money without costing a dime. Take back control of unchecked print management and enjoy greater efficiencies in cost and productivity with streamlined, greener workflows. If you're like most companies, you don't know how much you spend on printing, or even how many printers you have in your organization. With so many organizations lacking oversight of their print cost, it's no surprise that gaps in print efficiencies are widespread. From unnecessary color printing to abandoned print documents, unmonitored printing and lack of a cohesive printing workflow are common leaks in most companies' budgets, which also contribute to environmental strain. Our document workflow and print management software, Abacus, is the environmentally friendly solution to plugging your print-related budget drains. Streamline printing with insightful dashboards that give you visibility into your complete print environment. Go beyond print tracking to identify savings opportunities, monitor usage, track your goals, and analyze behaviors with an easy-to-use dashboard that provides real-time and accrued snapshots into your print environment. See how users and devices behave in real time and gain insight into document and activity patterns. Monitor your green goals and initiatives, track your progress, and identify additional opportunities that can help you achieve even greater advances in your quest to go green. 40-60% of help desk calls are print-related. What could your IT team accomplish if you gave them up to 60% more time each day? Abacus is easy and fast to configure, giving you control of your print environment so you can give your IT team back their work day. 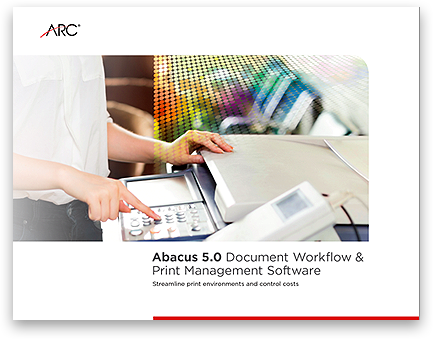 Abacus is simple to set up, getting you up and running in minutes and setting you down the path of taking back your print costs. Track usage behavior, monitor workflows, and eliminate waste with an easy-to-understand dashboard and empower your employees to make better choices with an easy to use interface on all of your print devices. Whether you know it yet or not, printing is likely to be your third highest operating expense, behind only payroll and rent. Intelligent print management software can be the first step in containing and reducing these costs, but many businesses are overwhelmed by the complex system requirements and time-intensive training required to get document workflow initiatives off the ground. 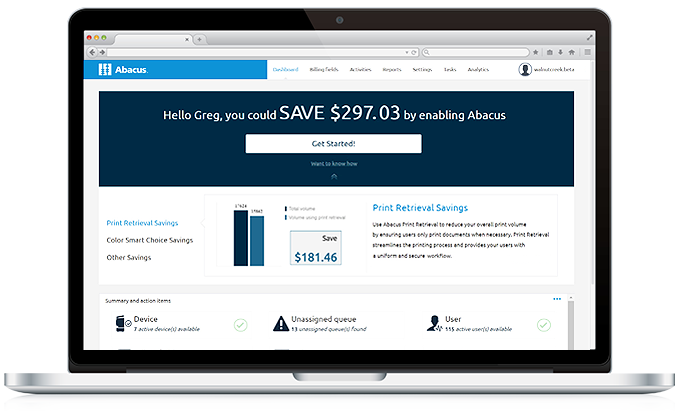 Abacus was designed to make it easy: easy to install, easy to use, and easy to save. Abacus provides a single, easy to use interface across all of your company’s print devices and, just as importantly, a single print queue that can be accessed from any printer. Streamline processes and reduce print usage with file storage, sharing, and cloud file management. Capture all of your printing costs with a single, automated report that reveals waste so you can eliminate unnecessary expenses and optimize your print environment. Securely and quickly scan to folders or email for fast, simple, and convenient scan management and document retrieval. Do you know what the real cost of printing is for your company? For an average company, annual direct printing expenses are approximately $2700 per employee. More important than how much you’re spending, how much could you be saving? Pairing document workflow and print management software with Managed Print Services (MPS), such as ARC Managed Print Solutions can yield savings of up to 30% for the average business. Eliminate overnight document shipping and the environmental impact of all the packing materials, trucks, cargo jets, and the massive carbon footprint that comes along with it by digitally shipping your documents. Whether you need to get your construction documents to the next state or tradeshow collateral across the country, ARC's remote print network saves time, money, and a whole lot of energy. Digital printing isn't the only ARC solution to help you achieve your green initiatives. With Abacus' built-in green reporting features you can monitor your progress toward green goals and identify wasteful print habits that yield significant cost and environmental savings. ARC is committed to reducing our consumption of non-renewable resources. We work tirelessly with our vendors and suppliers to review and realign our practices to be greener and leaner and offer the same assistance to our customers. 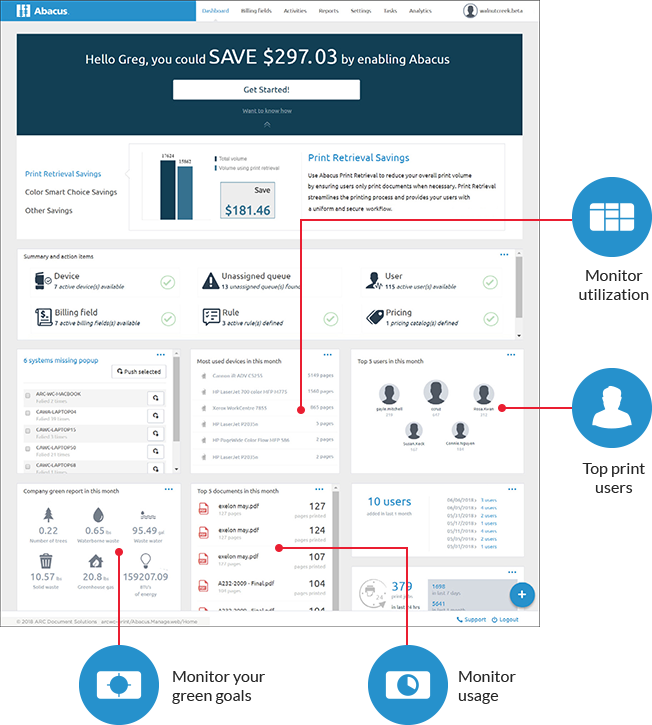 Abacus popups guide users to make cost-effective choices. Most print users don’t pay attention to or simply don’t bother to change the default printer settings when they send a job into the print queue. Abacus is the solution to put their focus on making better print decisions, with popup guides that will steer them toward more cost-effective or environmentally sound choices. With smart choice settings, users are prompted to consider alternate solutions when they are available and can easily continue, cancel, or redirect once they’ve made a decision. Print jobs are allocated to specific projects for easy cost recovery. 17% of printed documents are never retrieved. Abacus’ secure print environment uses print retrieval to cut back on costs associated with orphaned print jobs while keeping confidential printed materials secure. Recovering costs for necessary printing is made easy with project allocation built into the Abacus dashboard so users can assign print jobs individually to projects and project phases and add additional comments for your billing and recordkeeping needs. Send large and complex jobs to ARC directly from your desktop. Large, complex printing jobs can tie up your in-house printers for hours, creating backlogs and energy inefficiencies. With Abacus, you can send any file to ARC for printing directly from your desktop, saving you and your team from the time and labor intensive after effects of an overworked office printer and frustrated staff. 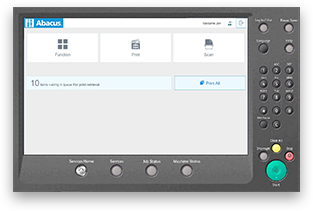 Monitor your entire print environment with the Abacus dashboard.